Aneurysmal bone cyst (ABC) is a benign solitary lesion of unknown aetiology. ABC’s mainly occur in the long bones but only rarely in the bones of the feet. 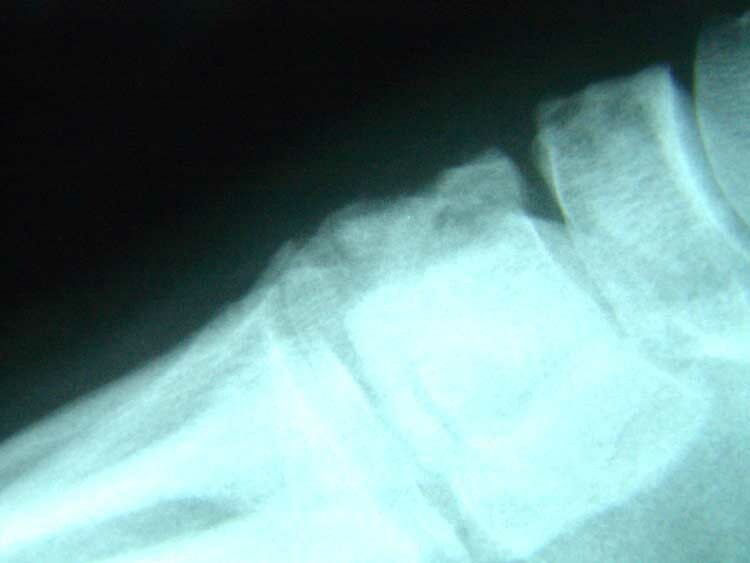 For example, frequency of occurrence in the foot is only 3% compared to other bones of the body. 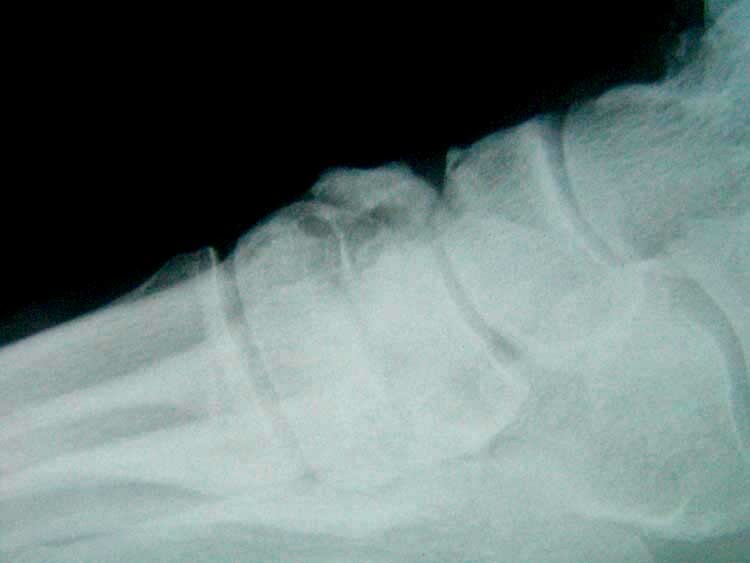 Very few cases of ABC involving the calcaneum have been reported. 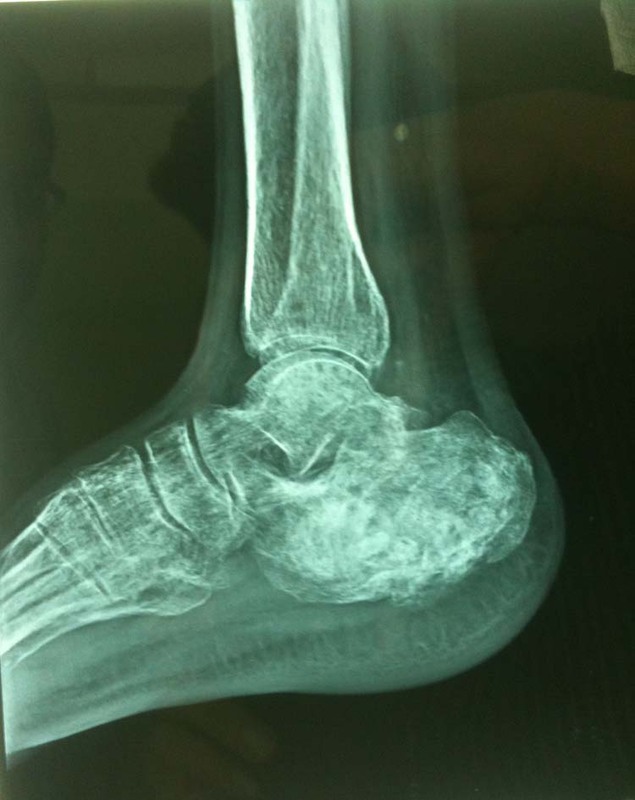 We report an unusual case of ABC of calcaneum in a 55 year-old male. Clinical presentation, histological diagnosis and treatment by curettage and bone grafting are described. The patient is now asymptomatic and there is no evidence of recurrence at 2 years follow-up. Key words: ABC, calcaneum, curettage, bone grafting. The aneurysmal bone cyst (ABC) is an expansile cystic lesion that most often affects individuals during their second decade of life and may occur in any bone in the body. [1-5] Although benign, the ABC can be locally aggressive and can cause extensive weakening of the bony structure and impinge on the surrounding tissues. A plethora of cystic lesions can occur in the calcaneum, which makes definitive diagnosis difficult based on imaging only. The differential diagnosis includes simple bone cyst, ABC (primary or secondary), chondroblastoma, giant cell tumor (GCT), osteosarcoma, ossifying hematoma or pseudotumor of hemophilia. 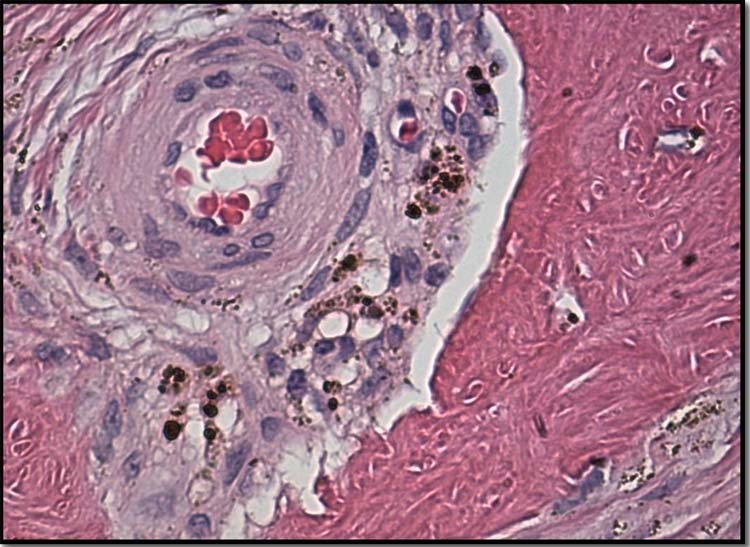 This mandates histopathological diagnosis prior to the definitive management. 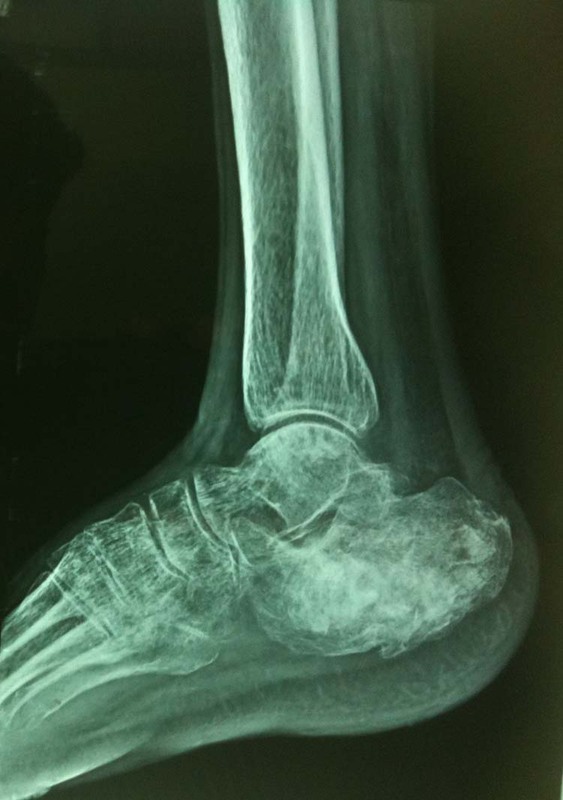 We report a rare case of ABC involving calcaneum of 55 year-old male confirmed by histopathology report and we performed curettage and bone grafting of cyst. 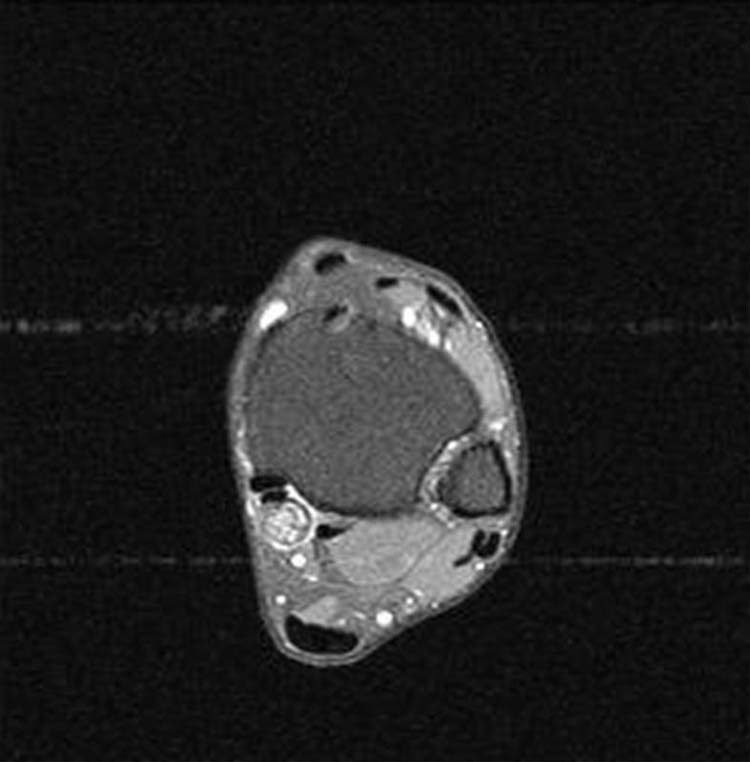 A 55 year-old male, manual laborer by occupation and known diabetic on treatment presented with a chief complaint of swelling in right heel during the last two years. 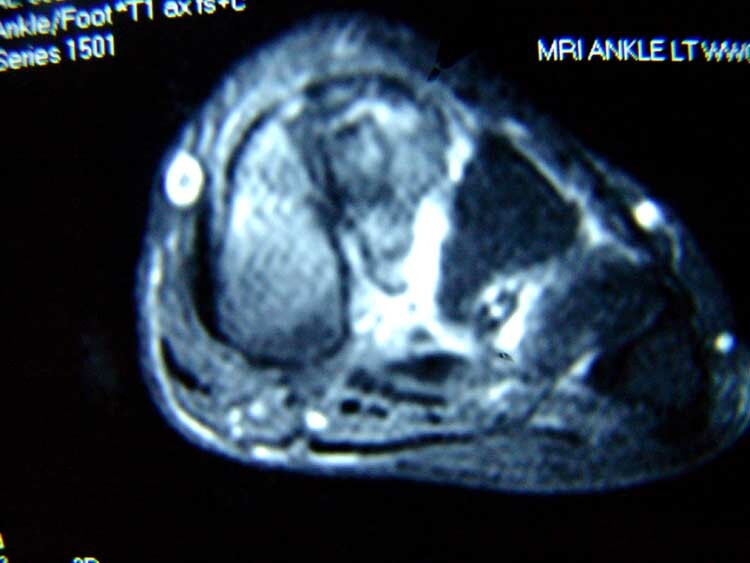 An increase in swelling was associated with pain in heel from the last one year. He had difficulty in walking because of pain. For the last two months, he was unable to work due to pain. He did give history of blunt trauma prior to the onset of symptoms. Clinical evaluation revealed swelling over the lateral aspect of the heel and the skin over the swelling was stretched. Tenderness was present on palpation but there was no local rise of temperature. The swelling was bony hard in consistency and arising from calcaneum. There were no distal neurovascular deficits or any significant lymphadenopathy. 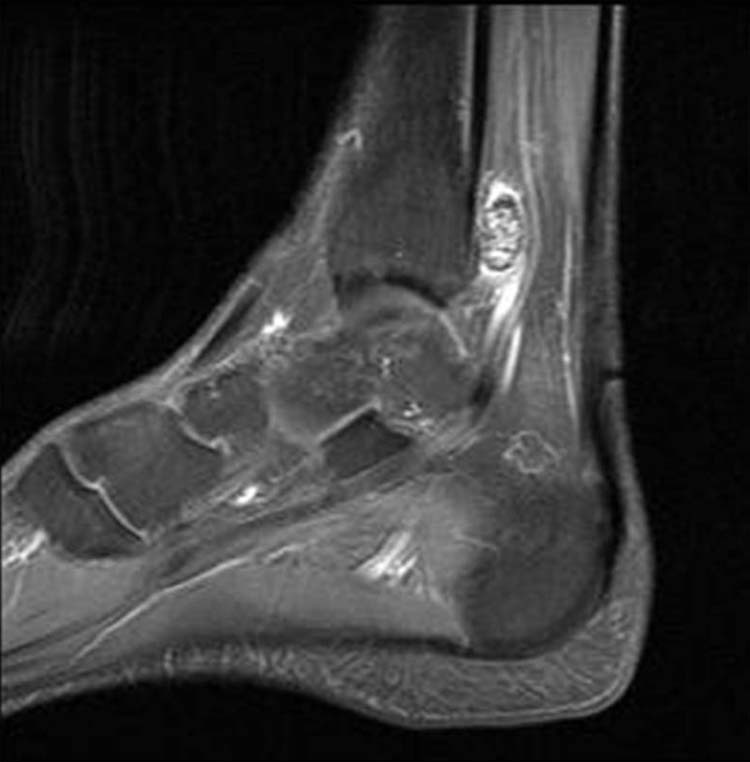 Radiographic examination of his ankle revealed an eccentric, expansile, multiloculated lytic lesion of the calcaneum with thin trabeculae traversing the cystic cavity. (Fig. 1) There was no breach in the cortex. 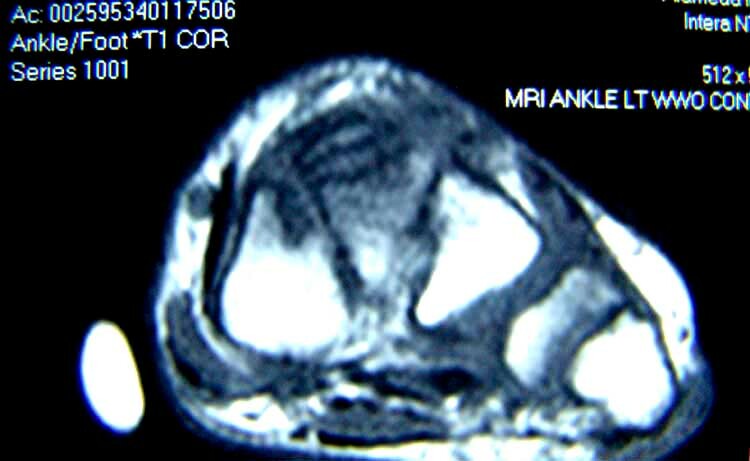 Based on clinical and radiological findings, a diagnosis of benign cystic lesion of right calcaneum was made. Figure 1 Pre-operative radiographs, antero posterior and lateral views showing eccentric expansile lytic lesion with thin shell of cortex and trabaculae traversing the cyst. 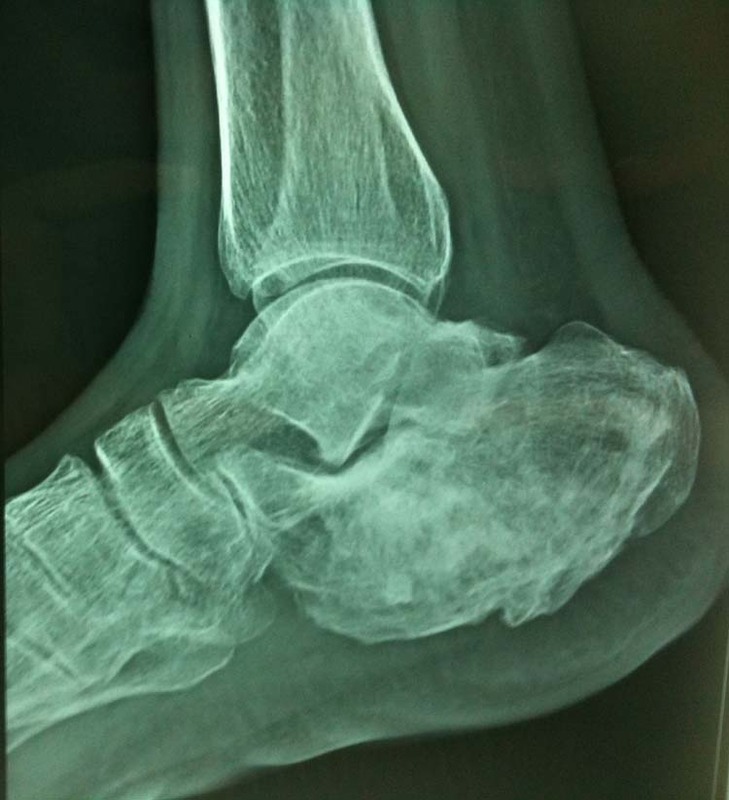 Hence the diagnosis of ABC involving the right calcaneum was made. 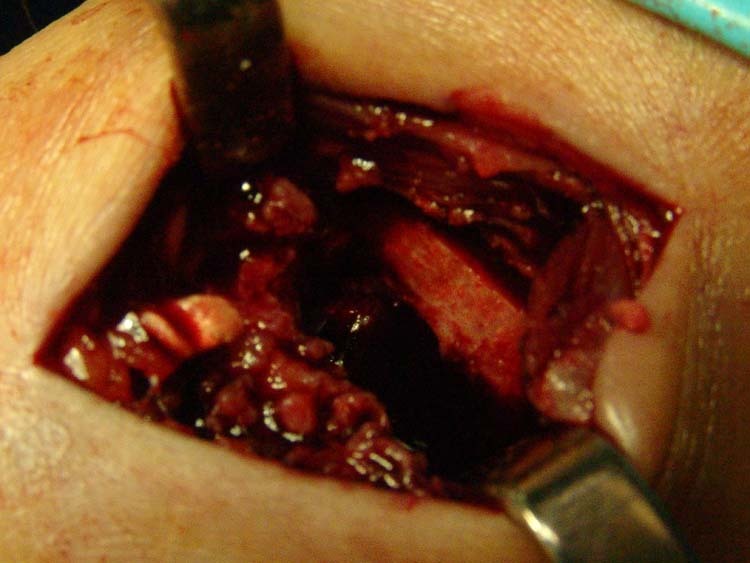 The patient was scheduled for cyst curettage and bone grafting. 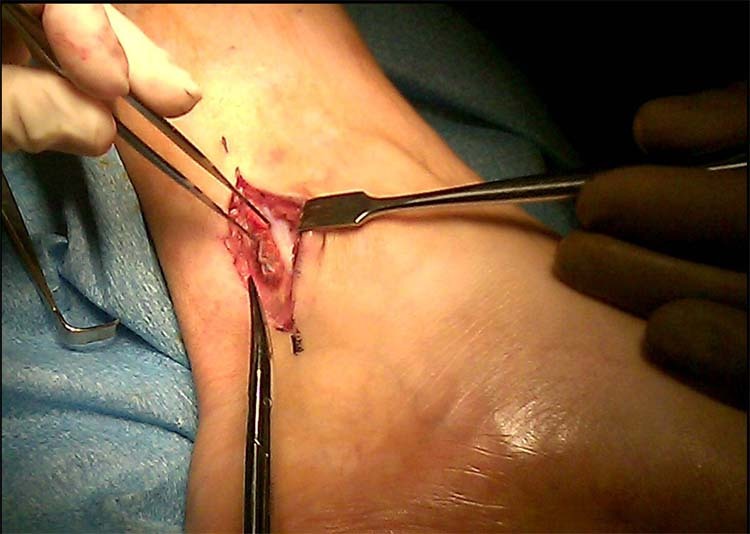 By curvilinear incision over the lateral aspect of heel, the calcaneum was exposed. A large cortical window was made and the entire cyst curettage was done. Then the cavity was washed with saline and packed with cortico-cancellous bone graft harvested from both iliac crests in addition to synthetic bone substitute. The patient was advised non-weight bearing walking on the affected limb for eight weeks. Later mobilised with partial weight bearing walking for a further four weeks and then followed by full weight bearing on affected limb. Figure 3: Follow-up radiographs showing incorporation of graft material at 1 month (A), 6 months (B), and at 2 years follow-up(C) showing consolidation of graft and no recurrence. 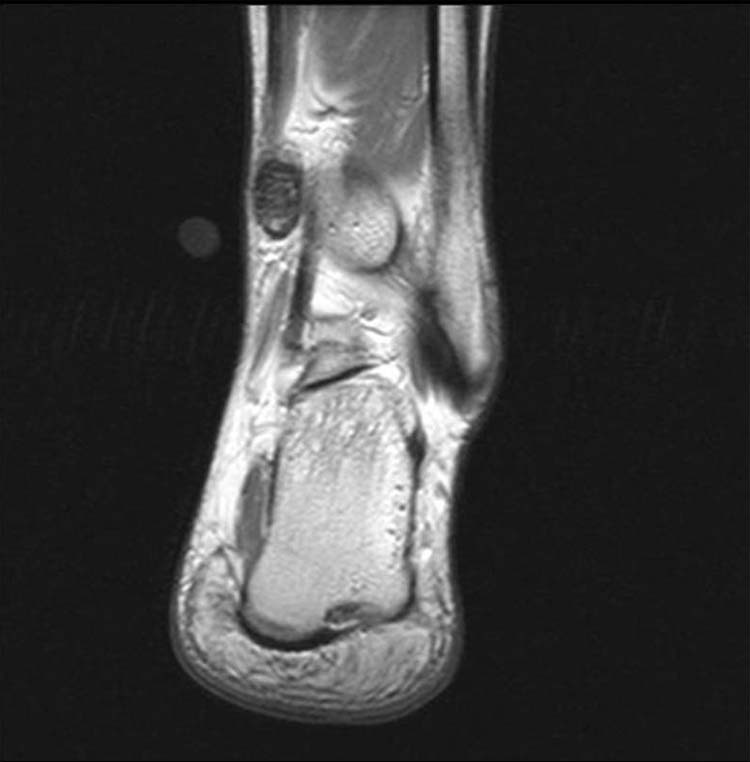 Clinically, calcaneal cysts are often symptomatic and present with heel pain, although some of these lesions may remain asymptomatic and are detected as incidental findings. Even though there are many typical radiograph, computed tomographic (CT) scan, and magnetic resonance imaging (MRI) findings to confirm a diagnosis of ABC, an open biopsy must be performed because of the high frequency of accompanying tumors. When a biopsy is performed, the sample should ideally include material from the entire lesion; a limited biopsy could easily cause a coexisting lesion to be missed, leaving the patient with a morbid prognosis. There are various methods of treatment based on the site and size of the lesion, which include curettage, which may be supplemented with various adjuvant therapies such as bone grafting, use of liquid nitrogen, phenol instillation and Poly (methyl methacrylate) (PMMA) cement. Despite a favorable outcome of ABCs with an overall cure rate of 90-95%,  one of the most common problems encountered during management is frequent recurrence. The incidence of recurrence has been noted to vary between 59% in cases treated with intralesional excision  and 0% in cases with resection. Recurrence usually happens within the first year after surgery, and almost all episodes occur within 2 years. Therefore, a patient of ABC needs to be observed for at least this period of time to exclude any recurrence. It is beneficial to detect recurrence early when the lesion is still small and easier to treat. To conclude, ABC of the calcaneum is an extremely uncommon entity. Proper diagnosis entails correlating the clinical presentation, anatomical location, radiological profile, and histopathological appearance. This is imperative not only to exclude other more common histological mimics, but also for choosing the appropriate therapeutic regimen and prognosticating the disease outcome. 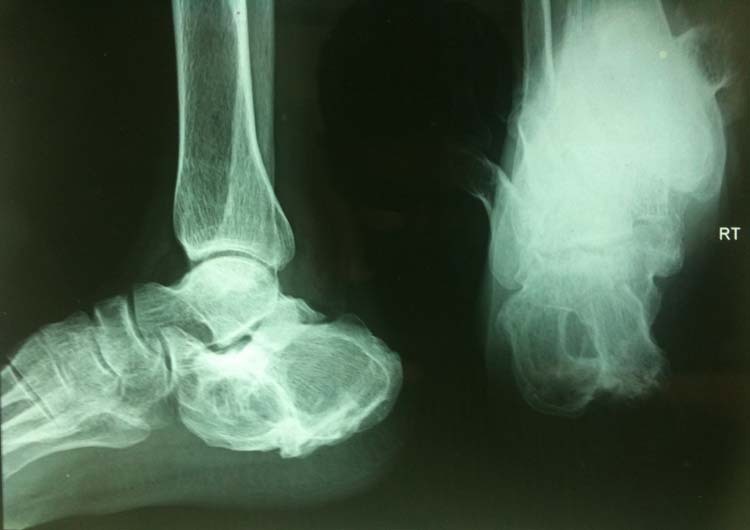 In a case of calcaneal cystic lesion, ABC should be considered as one of the differential diagnosis. Hence histological diagnosis is essential. Curettage and bone grafting is a valuable option. 1. Clayer M. Injectable form of calcium sulphate as treatment of aneurysmal bone cysts. ANZ J Surg 2008 78(5): 366-370. 2. Segall L, Cohen-Kerem R, Ngan B Y, Forte V. Aneurysmal bone cysts of the head and neck in pediatric patients: A case series. Int J Pediatr Otorhinolaryngol 21 2008: epub ahead of print. 3. Burch S, Hu S, Berven S. Aneurysmal bone cysts of the spine. Neurosurg Clin N Am 2008 19(1): 41-47. 4. 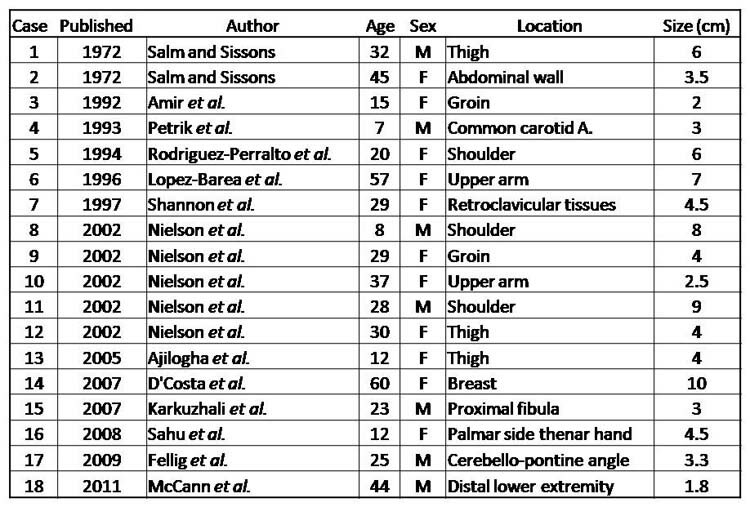 Brastianos P, Gokaslan Z, McCarthy E F. Aneurysmal bone cysts of the sacrum: a report of ten cases and review of the literature. Iowa Orthop J 2009 29: 74-78. 5. Sun Z J, Zhao Y F, Yang R L, Zwahlen R A. Aneurysmal Bone Cysts of the Jaws: Analysis of 17 Cases. J Oral Maxillofac Surg Jan 26 2010 (Medline). 6. Jaffe H L, Lichtenstein L. Solitary unicameral bone cyst with emphasis on the roentgen picture, the pathologic appearance and the pathogenesis. Arch Surg 1942 44: 1004-1025. 7. Campanacci M, Capanna R, Picci P. Unicameral and aneurysmal bone cysts. Clin Orthop 1986 204: 25-36. 8. Enneking WF. Aneurysmal bone cyst. 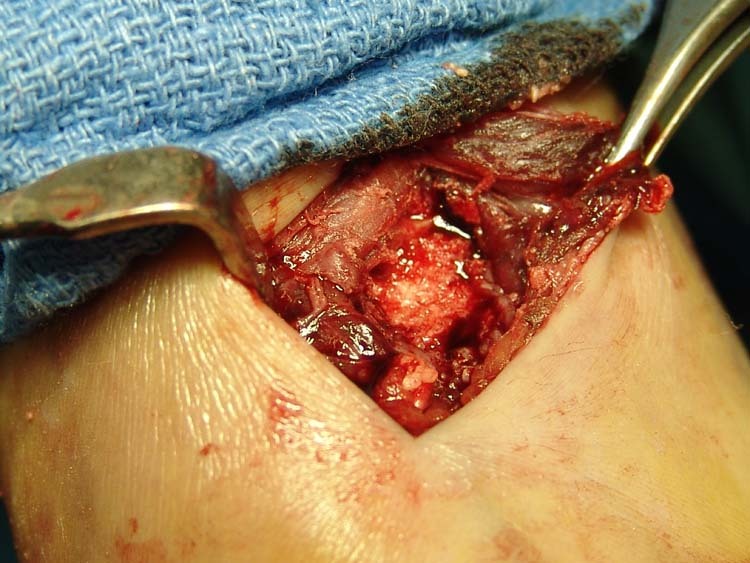 In: Musculoskeletal tumor surgery. New York: Churchill Livingstone, 1983; 1513-29. 9. Duke Orthopaedics: Wheeless’ Textbook of Orthopaedics, Aneurysmal Bone Cyst, Online article, Jan 2007. 10. Anand MK, Wang EA. Aneurysmal Bone Cyst. eMedicine, Jan 2007. 11. Unni KK, Inwards YC. Conditions that normally simulate primary neoplasms of the bone. In: Unni K K, Inwards Y C, editors. Dahlin’s Bone Tumors. 6th edition. Philadelphia: Lippincott Williams and Wilkins; 2010. p. 305-80. 13. Kransdorf MJ, Sweet DE. Aneurysmal bone cyst: concept, controversy, clinical presentation, and imaging. AJR 1995 164: 573-580. 14. Chowdhry M, Chandrasekar CR, Mohammed R, Grimer RJ. Curettage of aneurysmal bone cysts of the feet. Foot Ankle Int. 2010 31(2): 131-135. 15. Marcove RC, Sheth DS, Takemoto S, Healey JH. The treatment of aneurysmal bone cyst. Clin Orthop Relat Res 1995 311: 157-163. 16. Schreuder HW, Veth RP, Pruszczynski M, Lemmens JA, Koops HS, Molenaar WM. Aneurysmal bone cysts treated by curettage, cryotherapy and bone grafting. JBJS 1997 79B (1): 20-25. 17. Rastogi S, Varshney M K, Trikha V, Khan SA, Choudhury, Safaya BR. 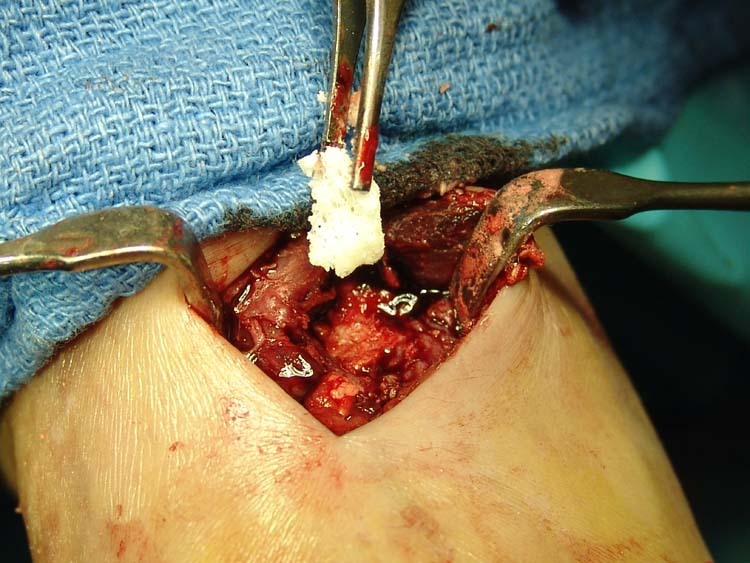 Treatment of aneurysmal bone cysts with percutaneous sclerotherapy using polidocanol. A review of 72 cases with long-term follow-up. JBJS 2006; 88B (9): 1212-1216. Address correspondence to: Dr. Prasad Soraganvi, Dept of Orthopaedics and Traumatology, Meenakshi Mission Hospital and Research Centre, Lake Area, Melur Road, Madurai- 625107, India. 1 Consultant, Dept of Orthopaedics and Traumatology, MMHRC, Madurai. 2 Consultant, Dept of Orthopaedics and Traumatology, MMHRC, Madurai. 3 Senior Resident, Dept of Orthopaedics, DMH, Madurai. The incidence of Aneurysmal bone cyst (ABC) is rare. 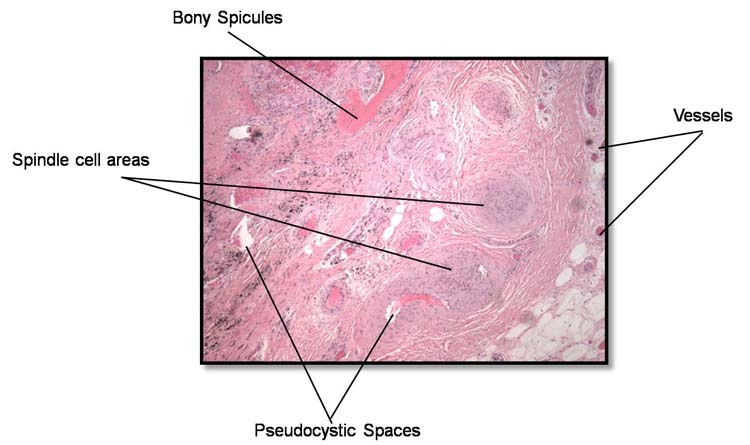 About 1% of all primary bone tumors constitute these lesions. They are most common in the upper extremity and rarely are reported in the foot. A case is presented reporting ABC of the middle cuneiform. To date, this appears to be the only documented case of ABC to the middle cuneiform. Surgical presentation and treatment using AlloMatrix ® bone putty as a moldable composite for an small, uncontained defect is described. 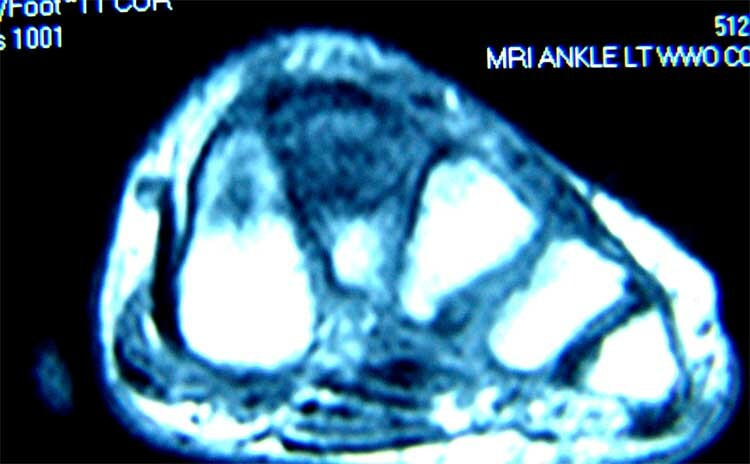 Aneurysmal bone cysts (ABC’s) in the foot are rare. 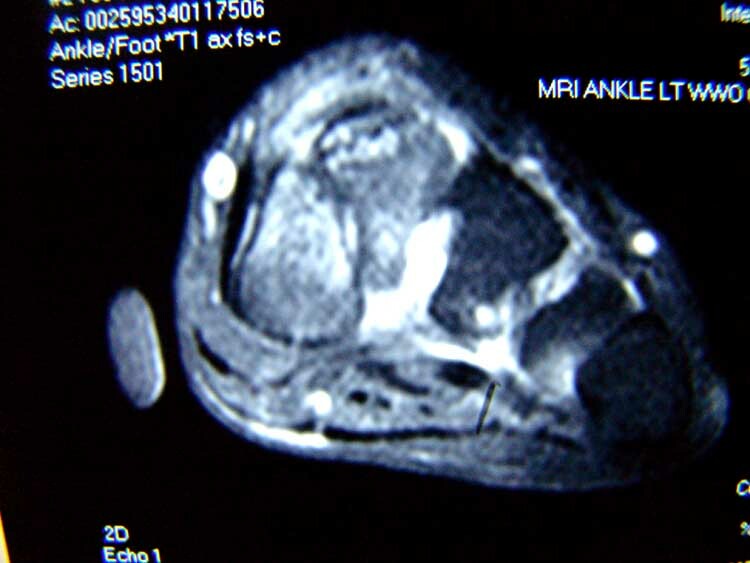 This bone tumor is usually found in the upper extremity, along metaphyseal regions of bone. Its frequency of occurrence in the foot bones is about 3% compared to other bones of the body. ABC’s represent about 1% of all primary bone tumors collectively. The etiology is unknown, although it is now commonly accepted that benign bone cysts are caused by trauma. These tumors are benign and are characterized by expansile compartmentalization within cancellous bone. 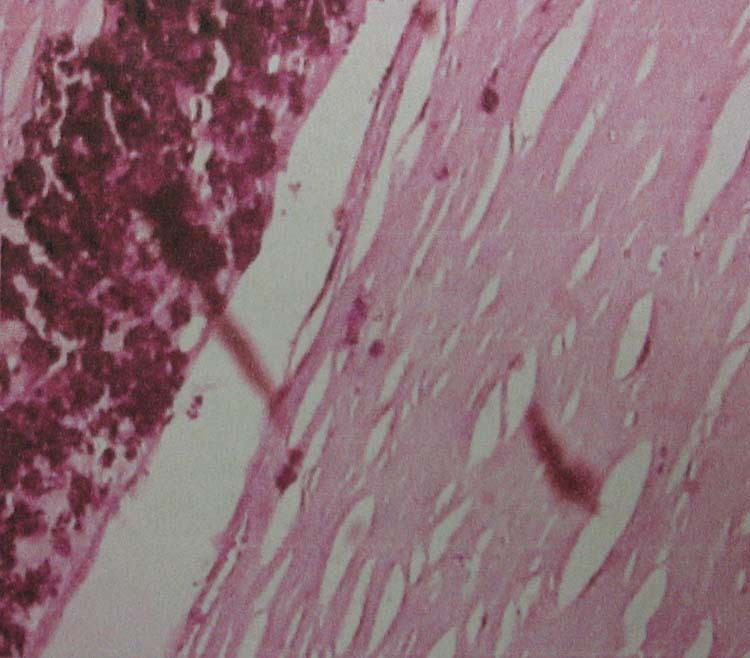 The lesions consist of blood filled spaces filled with connective tissue septa containing bone or osteoid and osteoclastic giant cells. Differential diagnosis will include giant cell bone tumor, telangiectatic osteosarcoma and angiosarcoma. The cyst is increasingly painful as it begins to expand, and diagnosis will usually be confirmed by ‘fluid-fluid’ levels and compartmentalization seen on CT and MRI. The cyst always begins within the cancellous bone and can erode through the cortex and expand to surrounding articular bone. However, this is a slow process and usually increased pain is associated with the cyst before it has a chance to erode through the cortex. The cyst is slow growing. Type 1: The cyst occupies the center of the bone with the profile either intact or slightly expanded. The lesion is usually metaphyseal in nature. Type 2: The cyst occupies the entire width of bone and the profile is severely enlarged. They are termed “central cysts” and are primarily metaphyseal. Type 3: The cyst appears as an eccentric, intraosseous lesion showing minimal expansion of the cortex. Type 4: The cyst is subperiosteal with superficial erosion of the underlying cortex. Type 5: The cyst has expanded into soft tissues and the cortex is destroyed. Table 1 Campanicci staging of aneurysmal bone cysts. A 42 year old diabetic female presents to our office with a chief complaint of increased pain to the mid-tarsal region over the past year. There is no history of trauma. No allergies are reported. The patient is presently on medications for diabetes, hypertension and hypercholesterolemia. The patient’s medical history is also significant for anemia, end-stage renal disease and heart disease. Surgical history includes cataract replacement and hysterectomy. Figure 1 Expansile changes to the bone are noted along the middle cuneiform. 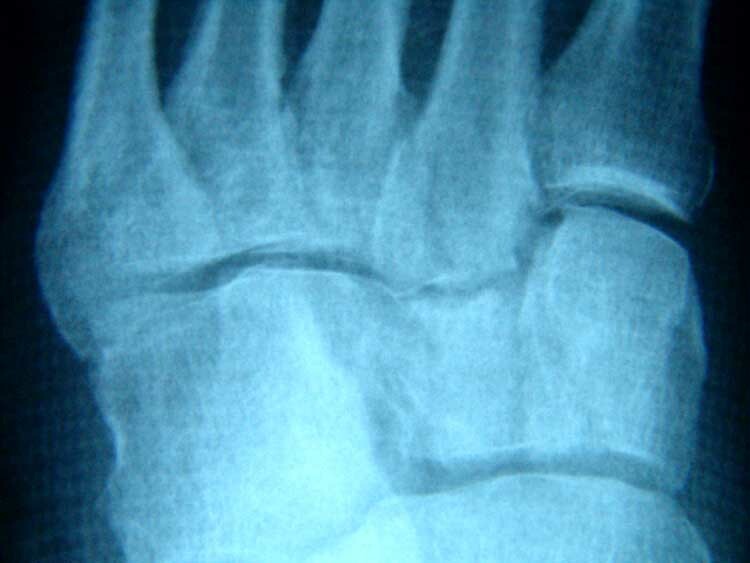 Cystic changes appear to involve both the base of the 2nd metatarsal and middle cuneiform. Figures 2,3,4 T1 coronal/axial images reveal classic fluid-fluid within the superior pole of the middle cuneiform (Fig. 1). Significant cyst growth is noted along the main body of the middle cuneiform (Figs. 3,4). Figures 5,6 Fat saturated post gadolinium T1 images reveal fracturing and compartmental changes to the body of the middle cunieform. In larger bones, this would correspond to the ‘soap-bubble’ effect often associated with the ABC. 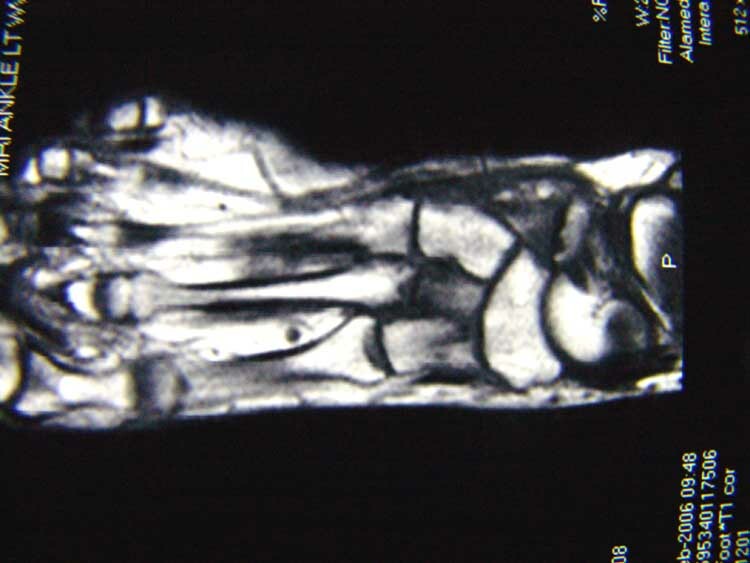 Figures 7,8 T1 images reveal extension of the cyst through the cortex of the middle cuneiform and base of the second metatarsal. 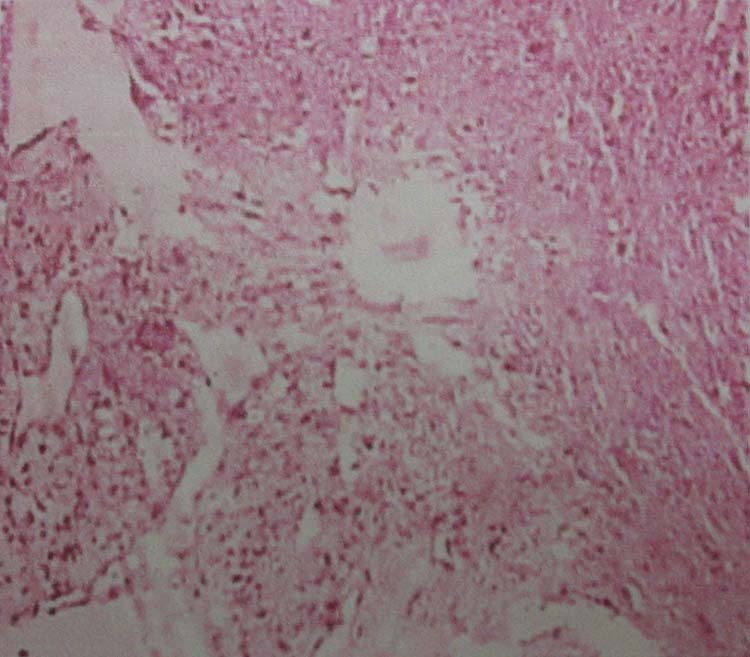 This would characterize the lesion as a Campanicci Type 5 ABC. Figures 9,10 The dorsal cortex of the middle cuneiform and 2nd metatarsal base is curettaged. A bone window is created revealing a soft cavity extending into the body of the middle cuneiform. Material evacuated from the body of the cuneiform was sent to pathology. Pathology report revealed sections of decalcified specimen with fragments of bone and cartilage. 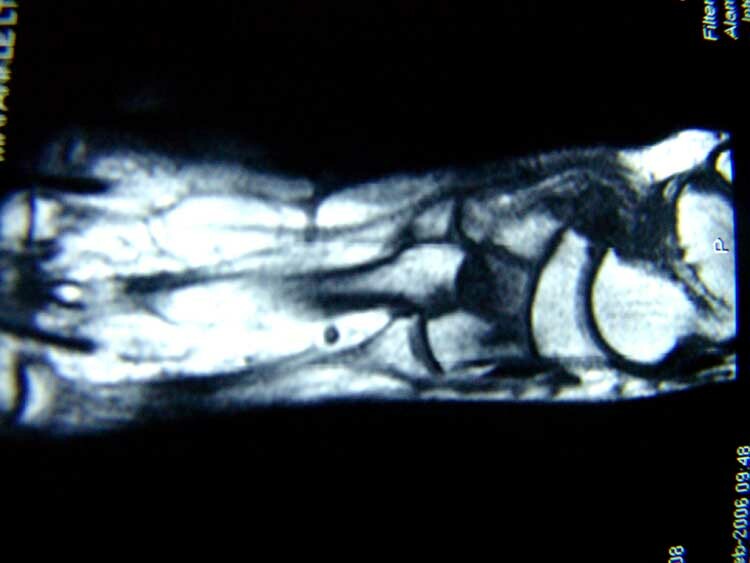 Fragments of devitalized bone, marginated by cartilage and chondrocyte cloning with variable cellularity. The material was serosanguineous in consistency. Areas of gelatinous-like material, deep red and purpuric in color were also evacuated from the body of the cuneiform. Figure 11 AlloMatrix ® bone putty kit. Figures 12,13 AlloMatrix ® bone putty is mixed and inserted into the defect. The consistency of the putty can be varied by the amount of saline used to mix the substrate. Figures 14,15 Post operative radiographs reveal AlloMatrix ® bone putty filling the cyst defect. “a peculiar blood-containing cyst of large size.”  Most ABC’s will occur between the ages of 10-30. Seventy-five percent of reported ABC’s occur under the age of 20, which would make this case even more unusual. There are variable techniques used to treat ABC’s. Some of these techniques include arterial embolization, intralesional injection, radionuclide ablation, local resection, en-bloc excision and intralesional removal. choice to not use an adjuvant procedure after removal of the cyst. In summary, this is a unique case of ABC in a diabetic female in her fourth decade. 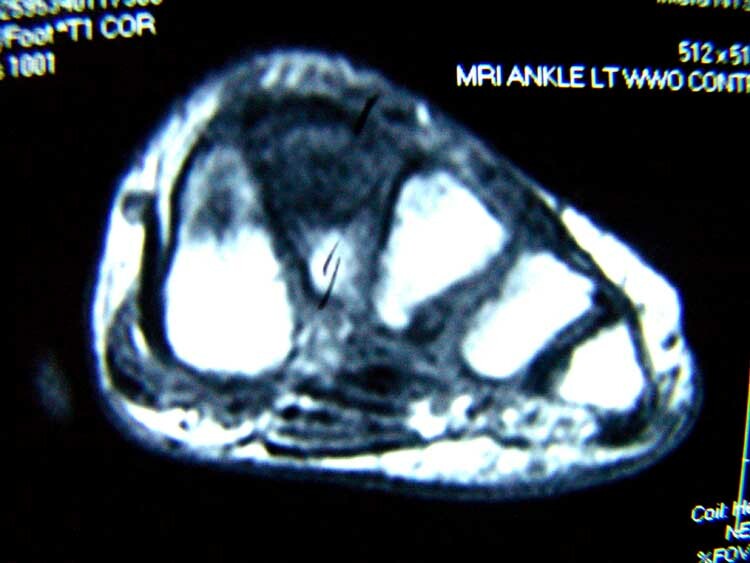 She does not fit the profile for development of this lesion, especially in the foot. However, due to her diabetes and associated neuropathy, it could be surmised that neuropathy and trauma may play an important role in the development of benign bone cysts. 4. 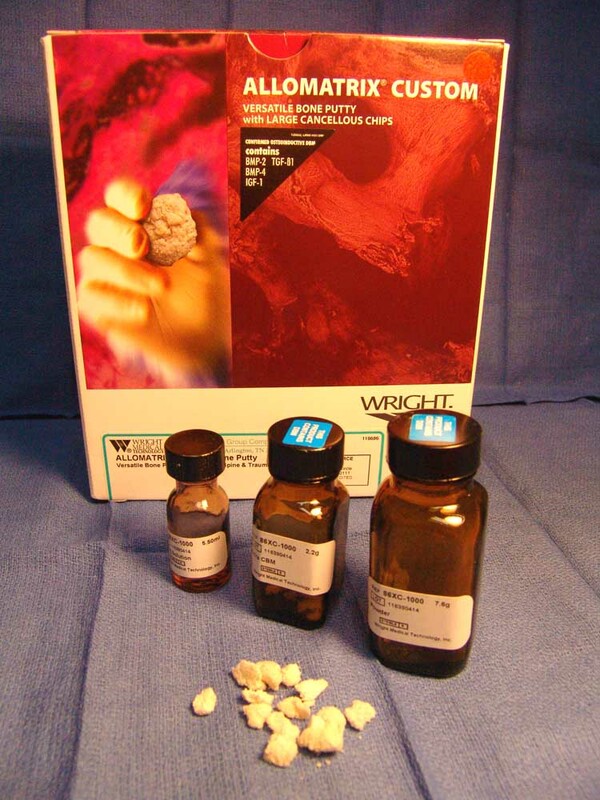 Wright Medical: AlloMatrix® Bone Putty with DBM&Cancellous Chips. 8. 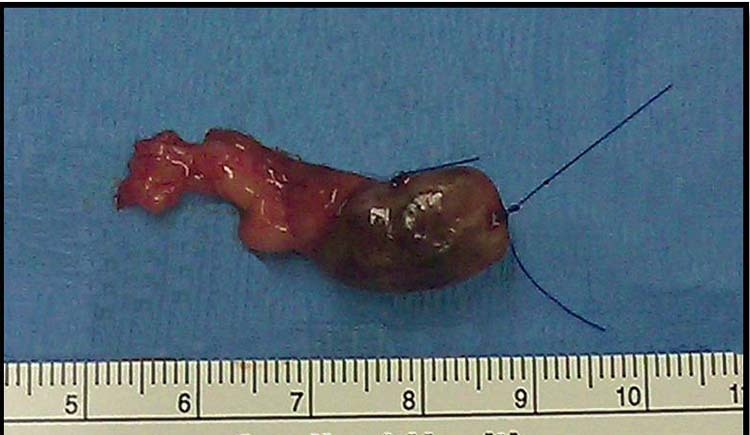 Schreuder, H.W., et al: Aneurysmal Bone Cysts Treated by Curettage, Cryotherapy and Bone Grafting, JBJS (UK), 79-B, No. 1, January, 1997.